I first tasted Linzer Cookies while on a trip to Austria back in the late 90’s. Linzer-type cookies are sold all over Europe. I’m in love with the combination of butter cookie and jam filling. 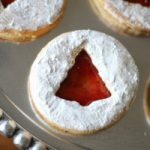 The recipe for Linzertorte is rumored to come from an Austrian Abbey in 1653.The Linzer cookie is a cousin to the famous Linzertorte, which is made with a buttery dough (often same as the cookie recipe), filled with jam, then topped with a lattice crust. I love my friend, Jolene’s recipe for Linzer cookies. It’s the best I’ve tasted. Trust me, I know a good Linzer cookie when I meet it. This one has ground almonds in the dough along with a bit of cinnamon, and almond extract. It’s remarkably easy to mix up and although they look complicated, they are fairly straightforward and the dough is easy to handle. Every Christmas cookie tray needs a jam cookie. I know you’ll love these on your holiday table. In a large bowl, or bowl of a food processor, cream butter and sugar. Add egg yolks and extracts, beat until light and fluffy. Add dry ingredients all at once, mix just until all of the wet and dry ingredients are incorporated, do not over mix. On a floured surface, turn the dough a few times until coated with flour. Roll dough to 1/8 inch thickness. Cut out with round cookie cutter. Continue rolling out dough with a bit of flour until all of the dough is cut and placed on cookie sheets. Cut small shape (circle, heart, etc) in the center of half of the cookies. Bake in 300-325 degrees oven until golden brown on bottom of cookie. Let cool completely. In a small bowl combine jam and lemon peel. Take the top of the cookies and press lightly into powdered sugar. Set aside. Spread a little jam filling onto the center of each of the cookies that do not have a cutout shape. Do not spread the filling to the edge of the cookie, it will eventually spread to the edge after the cookie is topped. Place the cutout cookie on top of the jam topped cookie. yields about 6 dozen single cookies, or 3 dozen finished Linzer cookies. *You will need a cookie cutter that is round or round with scalloped edge, also a small cutout (circle, heart, or any other small shape) for the center of the cookies.-If you want the cookies to be soft, place in an airtight container. If you prefer the cookies to be crisp, instead of soft, store in a single layer until ready to eat.-I placed all of the scraps in a pile and then re-rolled those a couple of times to prevent re-rolling the dough too many times. I also baked the cut-out center pieces and served those dipped in powdered sugar along with the filled cookies. Also spread a bit of jam on those and made mini-Linzers. Oh Mario would love these. I'm printing this recipe right now and taking up to my parent's for the holidays! Oh, the sisters fighting over who makes Mario cookies! Yes, he would love these. Pretty little cookies! 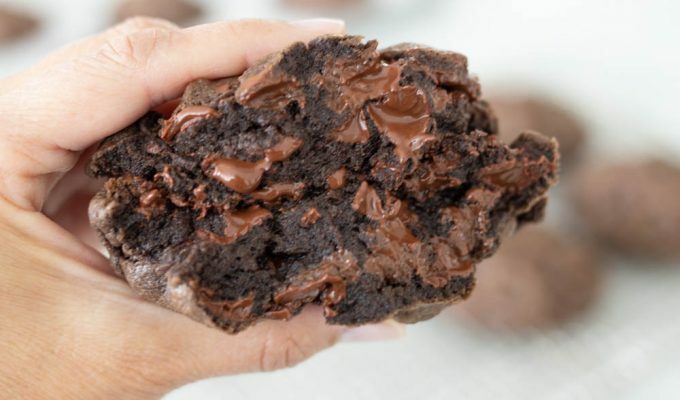 Look like they melt in your mouth! Made these for Christmas Eve dinner with family, my children absolutely loved making them with me, ages 5 and 3 and especially loved eating the cutout centers. The flavor is such a wonderful combo, almond, with raspberry and lemon flavors the piwdered sugar was a wonderful texture on the top compared to the shortbread like cookie texture! Will definitely make again. Thank you for the wonderful unique European Christmas flare!